Guests at Heartland Festival (DK) 2018 could donate a VELUX Natural Light solar lamp to areas without electricity in Africa. 200 guests decided to support the project and the lamps have now reached Nairobi, Kenya. A team of seven volunteer from The VELUX Group visited Heartland Festival (DK) 2018 where they sold the solar lamps under the concept “Give one get one”. Heartlands guests wholeheartedly embraced the concept and chose to donate more than 400 solar lamps for the good cause. Where do the lamps make a difference? The Natural Light solar lamps have been donated to school children and families in the slum area Kibera in Nairobi the capital of Kenya. Kibera is Africa’s biggest urban slum with an estimated 1.2 million people living in an area of approximately 2.5 square kilometers. Many of Kibera’s residents live on less than 1 dollar per day and without electricity, sewage and water. Emily Okumu a single-mother of five children in Kibera shows how the residents use a small petroleum flame to light up household activities like cooking and doing homework in the evening. The tiny flame poorly illuminates the room when the children are doing their homework. This means that the children sit close to the flame and inhale the dangerous petroleum fumes with bad cough and headaches as consequences. 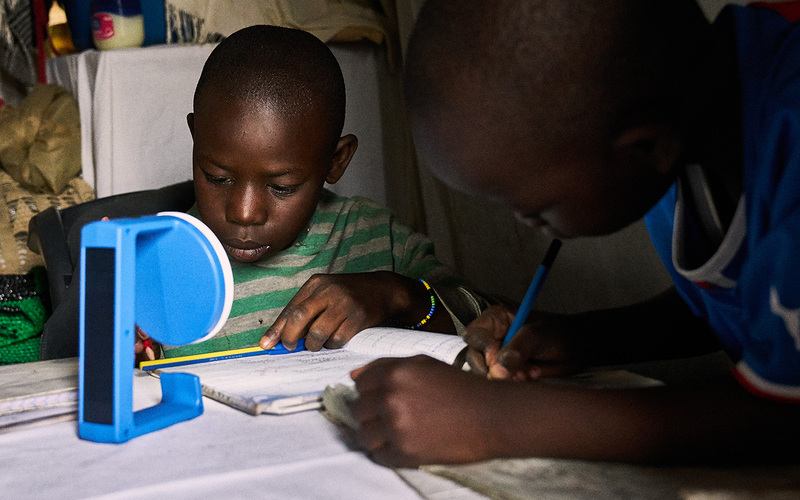 It was clear that the Natural Light lamp made a huge difference for the residents in Kibera. With the solar lamp we are providing light through renewable energy in the form of sunlight while eliminating the need for petroleum lamps that are both harmful and exhibit a fire hazard. The family shares the light by hanging the Natural Light lamp in the ceiling and it ensures that both homework and cooking can be done simultaneously. This wasn’t possible before, so the lamp is a significant improvement of their living conditions. Thanks a lot to all Heartland guests for the support! The Natural Light project had a stall and a mobile cart at the festival. At the stall festival guests could come by to hear more about the project, donate a lamp and see exhibited pictures of the proud donors. The Natural Light team also sold the solar lamp by pulling the cart around the campsite and meeting the guests in their tents and caravans. You can see a video of the activities below.